Drop some good brandy on a piece of refined-lump sugar, till it has absorbed as much as it will contain, which suffer to remain in the mouth till it be gradually dissolved. Repeat the same four or five times a day, and in the course of a few days the ulcers will wholly disappear. A medical writer in one of the Bath papers, in speaking of the best remedies for burns and scalds, which are to be procured instantly in most houses, states, that oil of turpentine is an excellent application; but this is not always at hand. Next to this in effect are the strongest spirits that can be procured, as aether, spirits of wine, brandy, rum, gin, &c. or, in the absence of these, vinegar. These should be applied by means of folded linen cloths to every kind of burn, and to scalds before the skin begins to rise. Soap dissolved in water is likewise a good application. 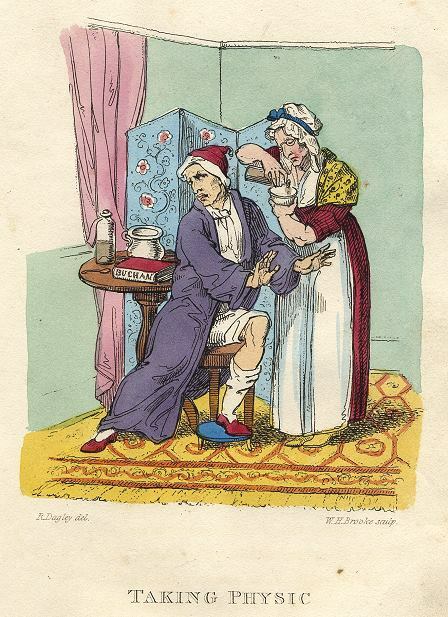 In proof of the efficacy of spirits, the following case is given: – At a respectable inn in the neighbourhood of Bath, a female servant, in taking a ham from the boiler, fell down, and was scalded in a dreadful manner, her neck and body being literally scarified: applications of cloths well soaked in brandy were immediately resorted to, and proved almost miraculously efficacious, so much so, that when a surgeon, who had been sent for, arrived in about an hour after the accident happened, he said nothing could improve the appearances; he declined ordering any thing but a continuance in the same process, and in a few days the poor girl was quite recovered, and soon after scarcely a vestige, or even appearance of the accident remained. Pulverised chalk, mixed with whites of eggs to the consistence of cream, frequently applied to prevent its congealing, is also declared to be an excellent remedy for burns or scalds.